Salvagers are confident debris and human remains can be recovered if Malaysia Airlines MH370 is finally found, despite the pitch-black darkness, crushing pressure and ice-cold water awaiting them. 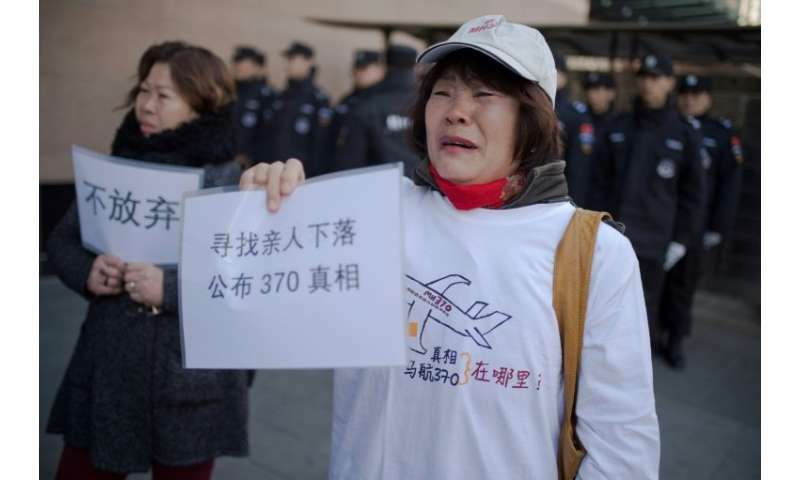 The disappearance of the Boeing 777 carrying 239 passengers and crew almost four years ago is one of aviation's greatest mysteries, with an Australian-led hunt across a 120,000 square-kilometre (46,000 square-mile) zone failing to reveal the crash site. Yet a new probe now underway by private firm Ocean Infinity—commissioned by Malaysia on a "no find, no fee" basis—has revived hopes the doomed plane might be found. If the wreckage is located in treacherous terrain up to six kilometres (19,685 feet) deep—far off Western Australia and north of the earlier search site—experts say high-tech underwater robots can handle the demands of recovery. "They (searchers) are working at the extreme edge of what's capable," South African salvage master Nick Sloane, who led the operation to recover the stricken Italian cruise ship Costa Concordia, told AFP. "(But) the benefits to the manufacturers of the aeroplane, operators and the families are that if you actually locate the wreckage, it's worthwhile to go ahead and take the next step and recover it." 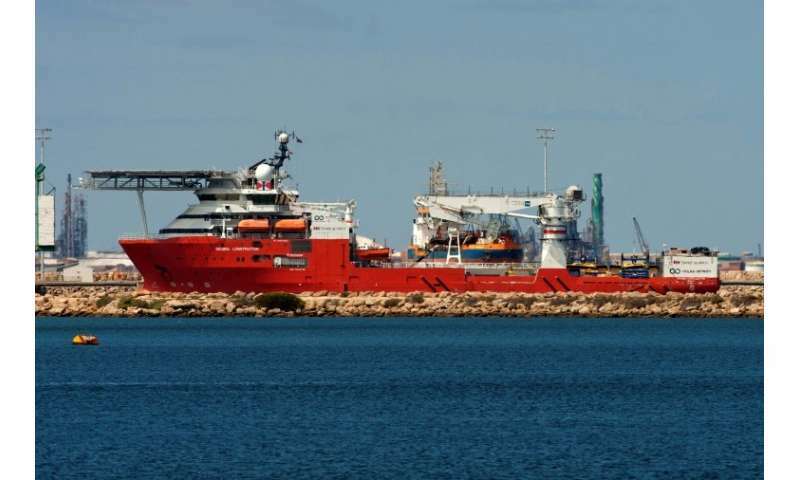 That expedition would require cutting-edge technology, likely last months and potentially cost more than the maximum US$70 million reward Malaysia is offering Ocean Infinity, according to deep-ocean salvagers. 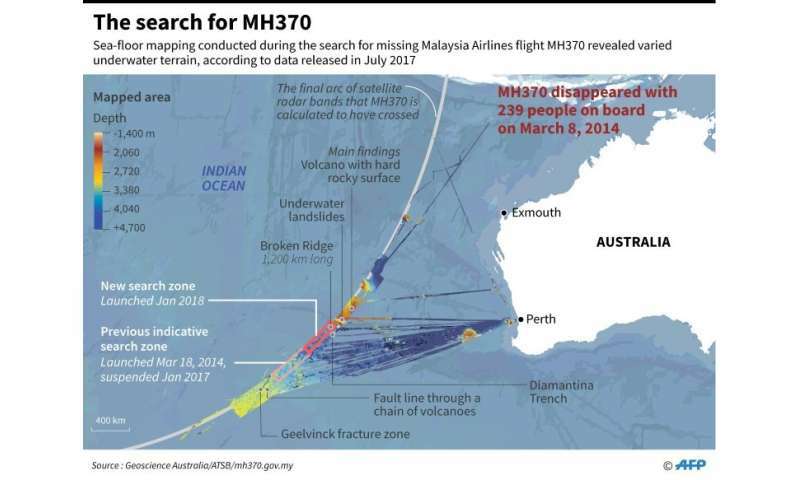 Map showing search zones for missing MH370 and areas covered by a sea floor mapping. To aid the previous search—the largest in aviation history—the ocean floor was mapped in detail for the first time, revealing the varied underwater terrain. It showed seafloors more than 4,700 metres deep, vast mountains 1,500-metres high and kilometres wide, deep canyons and massive underwater landslides of sediment, Geoscience Australia said. If debris is found between 2,000-6,000 metres—known as the abyssal zone—salvagers would work in a perpetually dark and near-freezing region where the pressure can reach up to 9,000 pounds per square inch (psi). Wreckage has been recovered from such depths previously: Air France 447 at nearly 4,000 metres in the Atlantic, the cargo ship El Faro (4,500 metres) off the coast of the Bahamas, and South African Airways 295 (4,900 metres) off Mauritius—far deeper than where oil and gas companies operate. 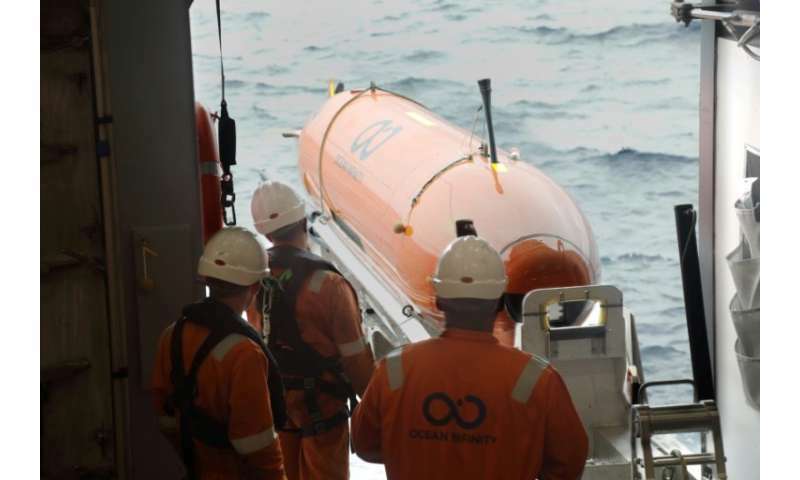 Machines that can operate at such extremes include deep-ocean operator Odyssey Marine Exploration's remotely-operated vehicles, which have frames constructed out of high-strength aluminium. A handful of other companies have similar technology. The ROV, tethered to the mother ship, is fitted with LED lights that illuminate the dark environment and can record high-definition footage, Odyssey Marine's chief operating officer John Longley told AFP. The submersible—remotely driven by pilots on a surface ship—has two manipulator arms that function like "human hands" and can retrieve smaller objects, added deep-sea shipwreck hunter David Mearns. Larger parts such as the jet's wings can be brought to the surface using baskets or slings. Mearns said such underwater journeys could take several hours with the overall mission possibly lasting up to half a year. "But once you get into a position on the seabed, it's remarkable the dexterity of these ROVs in terms of what they can do," he added. On the surface, the ROV pilots would be supported by a vast array of hardware—including support vessels—as well as crew that could number more than 100, senior salvage master Wytse Huismans of high-profile global operator SMIT Salvage told AFP. The team would also have to grapple with rough seas—which could make its vessels inoperable during the winter in a few months' time—and the remoteness of the area, which is several sailing days from Australia's Fremantle port. But not all parts of the wreckage have to be recovered to determine what may have happened, the experts said, stressing that the black boxes could still hold key clues to the airliner's disappearance. Other parts of the wreckage may be hauled to the surface if needed to help unravel the mystery. Most of the plane's debris is likely scattered within a 1.5-kilometre field, wreck-hunter Mearns told AFP. "So even if it's in a challenging environment in terms of the terrain, they will have the capability to handle it, to recover it," he said, adding that a priority would be to retrieve human remains. From the Air France 447 wreckage, "also at a very extreme depth in the middle of the ocean, they were able to recover surprisingly a large number of bodies," he told AFP. "I think the authorities owe them (victims' families) the highest possible level of sensitivity to their needs."